Our Programme Director Peggy Hughes is reporting from Edinburgh throughout the 2018 book festival. 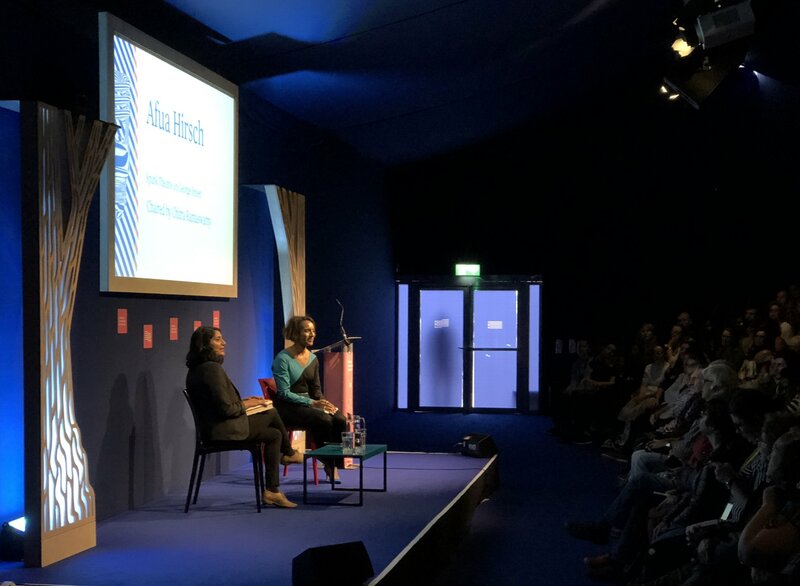 ‘It’s so important that we all have space in books’, said chairperson Chitra Ramaswamy in her introduction to Afua Hirsch on Tuesday at the Edinburgh International Book Festival. This event, a highlight for me – and I know for some fellow attendees – was a reminder of how wonderful a book festival conversation with two intelligent and passionate interlocutors can be: about ‘British values’; on Brexit and self-censorship and gratitude; about not being able to go anywhere where anyone else looks like you. Afua’s book Brit(ish): On Race, Identity and Belonging sounds like a fascinating gaze at identity (‘the new battleground’) and an attempt to tell real difficult truths about the world today. As you might guess, I’m packing in as many events as possible during my time here: I’ve dipped into Damian Barr’s literary salon (featuring the debut of Ian Rankin’s crime writers’ band (has anyone told Val McDermid..? Maybe we’ll break the news at Noirwich…)); I attended a ‘publishing salon’ in which the panel discussed talent spotting and nurturing the ‘next big thing’. I enjoyed the playful format that Nick Barley and Charlotte Higgins used for their conversation together: to best attempt to convey the convoluted, complex structure of Red Thread: On Mazes and Labyrinths, Nick drew topics at random from a (red) hat: Crete! Troy! Webs! The conversation had a pleasingly spontaneous quality, and made the audience feel like complicit eavesdroppers on something quite conspiratorial and special.